Doctor J. Danley Budd had a long career before opening his hospital in Two Harbors. A native of Grant County, Wisconsin, Budd was educated at Lawrence University and went into the drug business before deciding to study medicine in St. Paul at the St. Paul Medical College (which later became part of the University of Minnesota). He spent eleven years practicing medicine in Michigan—six as an assistant surgeon for an iron company and five as a lumber company’s physician. 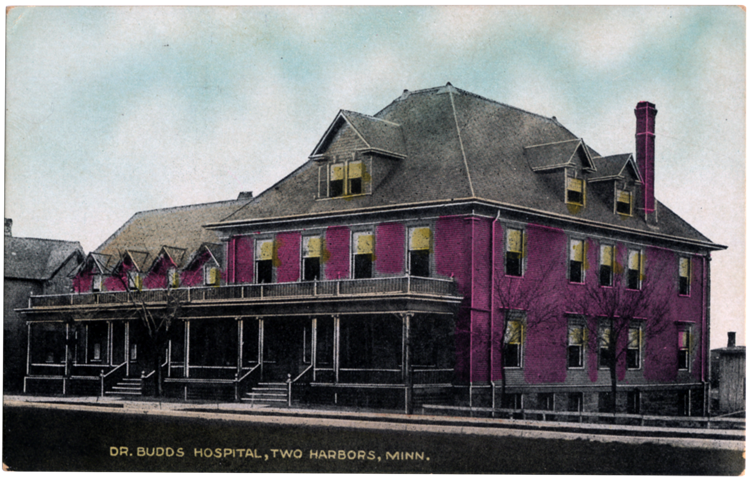 Budd moved to Two Harbors in 1888 as the chief physician for the D&IR and established his hospital in 1896 in a two-and-a-half story wood-frame building on the corner of First Avenue and Maple Street, boasting accommodations for twenty-five patients (it later expanded to hold fifty), and the Budd family as well. In order to provide good lighting and sanitation, the entire operating theater was finished in white tile. The hospital had all the modern equipment available at the time, including an X-ray machine. Most of the hospital’s early cases involved injuries that occurred in lumber camps and sawmills, at the ore docks, and on the railroad. Dr. Budd was also one of the five founders of what would become 3M, represented the region in at least one session of the Minnesota State Legislature, and was Lake County’s Medical Examiner and Coroner. He also owned what was considered “probably the finest collection [of books] in the Northwest”—some two thousand volumes, over half of which featured elegant bindings or were rare editions. The hospital is now the Lakeside Boarding and Lodging Home.